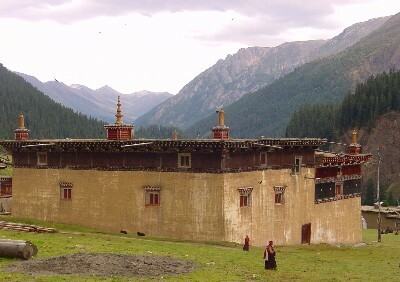 Lumorap Monastery (Tib. ཀླུ་མོ་རབ་དགོན་, Wyl. klu mo rab dgon) is a Nyingma monastery in Nyarong. It is a branch of Mindroling founded in 1896 by Tertön Rangrik Dorje. In the second month of the wood horse year (1714), the great treasure revealer of Mindroling Terdak Lingpa told his close attendants, “Now, I must take seven steps to the east.” He rose and took seven steps and then sitting down cross-legged, he spoke his Dying Testament. And may they be of one taste, indivisible within the sphere of the enlightened mind. Terdak Lingpa then said, “Now the dakinis have arrived to usher me on!” He moved his hands in the gesture of playing the hand-drum and bell, and adopted a contemplative gaze. At that moment, he manifestly revealed wondrous signs and miracles and so demonstrated his passage to the great pure land of Lotus Light. As prophesied in the 17th century by Terdak Lingpa himself, he took rebirth some seven generations later as Rangrik Dorje Kusum Lingpa of the Nyelo clan in the Nyarong region of eastern Tibet. From a young age, it was clear that Rangrik Dorje was a special child with a natural devotion to the teachings of the Buddha. He began his study under the great Nyarong meditation master Ridgzin Pema Dündul. Rangrik Dorje soon reawakened his past aspirations to benefit beings and did nothing but study, meditate and contemplate the profound tantric teachings his teachers bestowed upon him. He soon began revealing termas, or treasure teachings, which had been hidden in the 8th century by Padmasambhava; thereafter he was known simply as Tertön Rangrik. In the late 1800s Tertön Rangrik had a series of vision relating to the importance of establishing a monastery in the auspicious region of Ase in current day Kandze Autonomous Prefecture. Up until this time, Tertön Rangrik had wandered throughout eastern and central Tibet in the style of his teacher Ridgzin Nyala Pema Dündul, meditating in remote hermitages and teaching to those who requested. Upon having the visionary experiences indicating where to lay the foundations for a monastery, Tertön Rangrik secured the patronage of the 13th Dalai Lama Thubten Gyatso, with whom he had established a spiritual relationship in Lhasa already, as well as from the Tibetan government. The foundation for Ase Lumorab monastery took place in 1896. According to predictions and prophecies, the monastery was built on the back on a garuda who was swooping down to take a snake with his outstretched talons. The alpine river in front of Lumorab symbolizes the snake and the ridge line above the monastery clearly appears as the talons of a garuda coming down to apprehend the snake. Thus Lumorab is said to be built on the back of a garuda. Lumorab’s official name given by the 13th Dalai Lama Thubten Gyatso was Thubten Shedrup Yeshen Shok Choki Ling. The upper temple served as the lhabrang, the residence of the reincarnate lamas, as well as where the day to day management took place, while the lower building was where the monastic assembly gathered for empowerments, teachings, daily liturgical recitation and sacred rituals. Under the tutelage of Tertön Rangrik’s learned nephew, Khenpo Aten, Lumorab quickly became known throughout eastern Tibet as a center of scholarship, debate, and contemplation par excellent, and nearly thirty branch monasteries in Barong, Nyarong, Litang, Sanyhe and elsewhere were founded by Lumorab’s graduates. Near the end of the 19th century, the Mindroling bone lineage was in danger of being severed as the Eighth Minling Trichen, Gyurme Dechen Chokdrup, had only begot daughters. According to prophecy, should the Mindroling and Sakya bone lineages ever be broken, drastic consequences would befall both spiritual lineages as well as the Tibetan nation. The Nechung Oracle consistently urged the 13th Dalai Lama to find the true flesh of Terdak Lingpa to succeed the throne at Mindroling. The oracle even specifically said that any offspring of Tertön Rangrik of Lumorab would be equivalent to Terdak Lingpa’s son. With the Nechung prophecies, as well as the 13th Dalai Lama own concern for the Mindroling lineage, he invited Tertön Rangrik and his son, Pema Wangchen, to Mindroling where the latter succeeded to the Mindroling throne taking the Eighth Minling Trichen’s daughter, Jetsun Chimé Deden Drolma as his spiritual wife. Thus, Tertön Rangrik, who held both the blood and bone line, as well as being the incarnation of Terdak Lingpa, restored the great Mindroling lineage through his first son Pema Wangchen. The 13th Dalai Lama ceremonially offered Pema Wangchen the name of Kelsang Thubten Jigme Gyatso when he sat on the throne of Terdak Lingpa. It is said that the great monastic learning centers of Mindroling and Lumorab merged inseparably at this time, like a great river, and were subsequently known as the Upper and Lower Monastery. All of Mindroling’s ritual traditions, sacred arts, and annual ceremonies were taken on by Lumorab, while the scriptural bases of Lumorab remained as Tertön Rangrik’s twenty-five volumes of spiritual writings and revealed treasures. "It is impossible, too, to enumerate all those who passed into the rainbow body by the paths of the profound treasures of the Great Perfection, as exemplified by the Southern and Northern Treasures tradition. Even during this late age, this may still be illustrated. For example, in 1883/84 (water sheep year, fifteenth cycle) the lord among accomplished masters, Rigdzin Pema Dündul, vanished in the body of light. Afterwards, when his personal disciple, Tertön Rangrik Dorje passed away at Mindroling, his remains vanished into light. What was left behind, which was about six inches in size, was taken to Lumorab in Eastern Tibet, where it can still be seen today." Though Lumorab was extremely remote in the highlands of the Tromthar plateau, during the Cultural Revolution it was not spared destruction. However, the most important relic of Lumorab, the actual remains of Tertön Rangrik, which Kyabjé Dudjom Rinpoche mentioned, was saved. This was taken as a sign that the revitalization of Lumorab and its institutions would flower once again when the auspicious conjunctions of events allowed. ↑ See external link to Lotsawa House. ↑ Dudjom Rinpoche 1991: 919. This page was last edited on 9 April 2019, at 19:30.